Honda CBR250R was recently launched in India for INR 1.63 lakh. The motorcycle is one among most reliable two wheelers of India and thus, it would not be easy for rivals to beat this Honda in its own game. The powerful quarter liter engine on CBR250R is good for 26.5 HP at 8500 rpm and 22.9 Nm at 7000 rpm. It uses liquid cooling, fuel injection and 6-speed gearbox for refined riding experience. The bike weighs 164 kg and also brings an ABS equipped version with Nissan calipers for INR 1.93 lakh. The fuel tank measures 13 liters while seat height is 784mm. Yamaha Fazer 25 is an affordable tourer with excitingly low price tag of INR 1.29 lakh (ex-showroom Delhi). 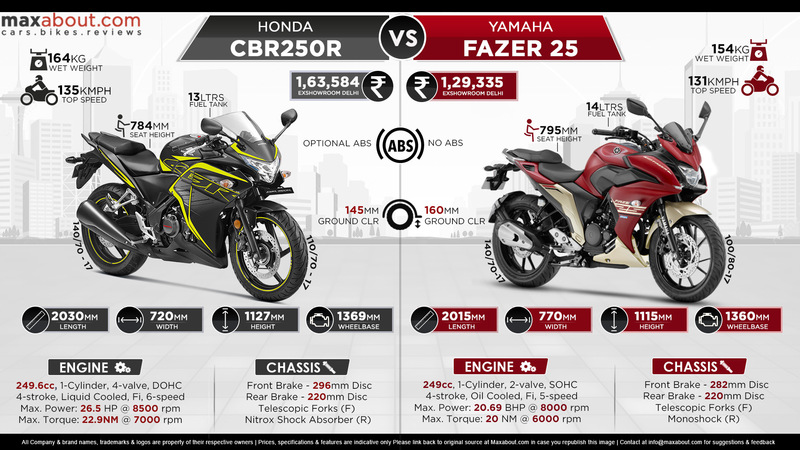 This makes it quite more affordable in comparison to CBR250R. Also, it comes with a decently powerful quarter liter engine producing 20.69 BHP and 20 Nm of torque. The engine is fuel injected but uses oil cooling as standard. Gearbox on use here is 5-speed while overall weight is 10kg lower at just 154 kg. Seat height is a bit higher at 795mm but still can prove good for average built riders in India. Downloaded 184 times this week.